Please note that the registration will be limited to 50 participants for this workshop and there will be no on the spot registrations. We would like to iterate that in order to provide quality professional development to all valued members and to run this association effectively we need your full support and punctuality. Since seats for the session are limited, interested members are requested to kindly confirm their participation latest by Friday, March 7, 2014 at registration@ptan.org or 36347611-14 / 36826991-4 Ext. 8554/8556 (Tuesday-Friday between 9:00 a.m.-5:00 p.m.), as this will facilitate us in organising the workshop effectively. On behalf of EYLA Executive Committee, we would like to invite you for the EYLA workshop to be held on Saturday, March 8, 2014. Nikhat Ambreen has been associated with research for the last the 10 years. She possesses Master degrees in Statistics from Karachi University. She has vast experience of conducting research on various social and business issues. As an ECD researcher, she has conducted various longitudinal and cross-sectional research studies including implementing ECD curriculum in classrooms and community based studies. In addition to research activities, she has facilitated and conducted various trainings for teachers, lady heath workers and community members on topics related to early childhood development; monitoring and evaluation; research skills. Presently she is working as research coordinator in Aga Khan University. Registration will start from Friday, March 7, 2014 at 8:30 a.m. Since seating at the workshop is limited, aspiring participants must confirm their participation at registration@ptan.org or phone # 36826991-4/36347611-4 Ext. 8554/8556. Available seating will be assigned on a first-come, first-served basis, and the registration will be closed once the workshop has been fully subscribed. It is a pleasure to inform you that this month ASSET is organizing a session titled “Action strategies to enliven and engage students”. Engaging students in active learning and making it fun and worthwhile is sometimes a difficult task for teachers. The session will discuss how to make a classroom engaging by a teacher. 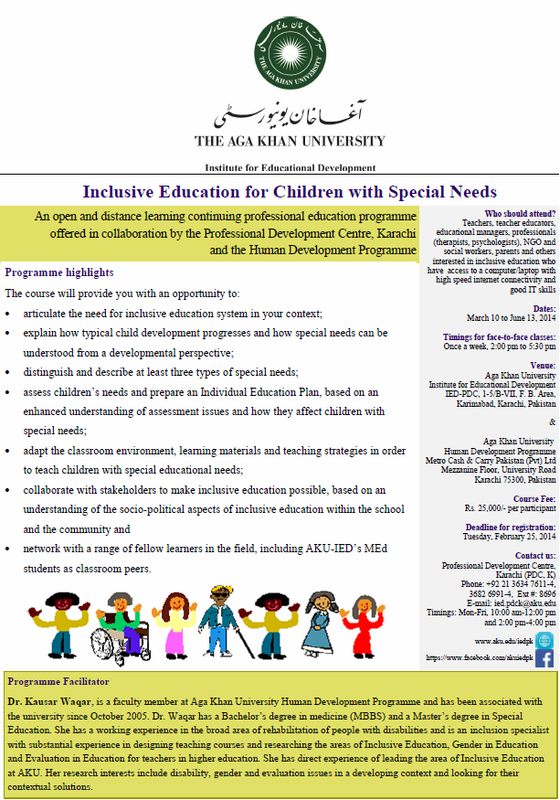 Venue: Aga Khan University, Institute for Educational Development (AKU-IED). Ms. Husna Arif has attained double Masters from University of London, UK in Teaching and Muslim Societies & Civilization. She has been in the field of education for more than 12 years where she has extensively worked with reputable organizations as teacher, teacher educator and trainer for school leaders. She has conducted many training sessions for school leaders on Monitoring & Evaluation, Strategic Planning and Development of School Plans. As a Teacher Educator, she has facilitated sessions on various topics such as emotional intelligence, bloom taxonomy, activity based teaching on different subjects, assessment methods, learning styles etc. Currently, she is associated with Ismaili Tariqah & Religious Education Board for Pakistan (ITREB, P) as an Educator. Kindly confirm your participation latest by Friday, February 28, 2014 at 36347611-14 / 36826991-4 Ext. 8554-8556. Or register online at info@ptan.org or registration@ptan.org. The more you strive to win one domain of life (e.g. work), the more the other three domains(yourself, your home, and your community) must loose, but that shouldn't be so. Trading-off can leave you feeling exhausted, unfulfilled or isolated. And it hurts the people you care about the most. To lead a holistic life you must learn to manage your time, space and people around you. But most important you must learn to manage yourself. This workshop has been developed through a Harvard University research.  Timing: From 9:00 a.m. - 1:00 p.m.
Mr. Nadeem ur Rehman Khan is an educational consultant, a trainer and a social entrepreneur. He is the Executive Director of Learners’ Enrichment Cell [Bringing Innovation to Education], A Social Enterprise dedicated to provide learning organizations the highest quality consultation services and professional development trainings/workshops. He also serves as the Executive Committee Member for SHADE. He has previously conducted workshops in the areas of Multiple Intelligences, Cooperative Learning Strategies, Discipline Without Stress, Education Technology and Marketing Strategies for educationalists through various platforms. A Lifelong Learner, Nadeem has received professional education from the Institute of Business Management and Notre Dame Institute of Education. He is a certified teacher from the Australian Catholic University, Australia and an accredited trainer from Skill City, Bahrain. In view of limited seats available, prior registration for this workshop is mandatory. Kindly confirm your participation latest by Friday, February 14, 2014 at registration@ptan.org or (36347611-4/36826991-4 Ext. 8554/ 8556), as this will facilitate us in organizing the workshop effectively. Why should therapists/ teachers attend? Therapists, teachers and parents have very little knowledge of handling, associated problems, devices and teaching of the children suffering from Multi disabilities. Cerebral Palsy is part of this group. CEREBRAL PALSY is a non-progressive disorder of the brain and not a disease. It is not contagious and usually occurs due to lack of Oxygen to the brain during pregnancy, difficult childbirth and viral infections during infancy. This might result in trauma to certain parts of brain. Depending upon the part of the brain damaged, the effects can be mild, moderate or severe. This leads to various forms of problems associated that the child might experience, making it difficult for managing skills of daily life. Being ‘Physically Challenged’ does not necessarily mean that the child is also ‘Mentally’ affected. Special devices and method are applied to improve the quality of life of these children. Mrs. Shabana Nasar is a graduate from College Of Physical Therapy Department J.P.M.C. She did M.S. in Neuro Muscular Rehabilitation and completed her post graduate diploma in physical education from University of Karachi. Currently she is working as a Rehabilitation Principal in Alumeed Rehabilitation Association for Cerebral Palsy. She has been working with multi disabilities, children suffering from Cerebral Palsy for past twenty years. In view of limited seats available, prior registration for this workshop is mandatory. Kindly confirm your participation latest by Thursday, February 13, 2014 at registration@ptan.org or (36826991-94/36347611-14 Ext. 8554/8556), as this will facilitate us in organising the workshop effectively. This is to inform you that tomorrow's (February 8, 2014) SAP workshop has been postponed. 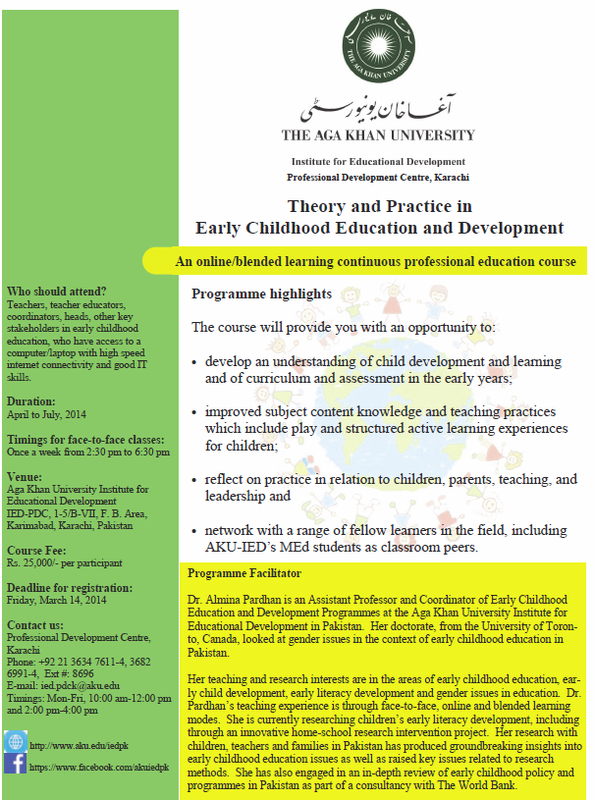 Now the workshop will be held on February 15, 2014. 4. Develop concept cartoon for their Science class. Kindly confirm your participation latest by Thursday, February 06, 2014 at registration@ptan.org or (36826991-4 / 36347611-4 Ext. 8554 / 8556), as this will facilitate us in organizing the workshop effectively. Eighth ASSET Olympiad on February 22, 2014. Theme "What is & What should be"
It is a pleasure to inform you that ASSET is organizing the Eight ASSET Olympiad on Saturday, February 22, 2014 at AKU-IED. The theme of the Olympiad is “What is & What should be”. This year Olympiad has been designed with the aim to explore the perception of children about various issues that Pakistan is facing nowadays. It will also give platform to children to share how they would like to change the situation. The main objective behind this activity is to develop a positive, healthy and realistic attitude towards the betterment of Pakistan as a nation. The students will work in groups and they will either prepare Skits or Posters on the given issue. This event has been designed to ensure a stimulating experience for all the participants. 09:00 a.m. - 09:05 a.m.
09:05 a.m. - 09:15 a.m.
09:15 a.m. - 11:00 a.m. The contest is open to all schools of Pakistan. Each school will be required to send one teacher and four students from Classes VI to VIII. Two (2) students for preparing and performing in skits. Posters and Skits will be evaluated by panel of judges. The decision of the panel will be final and undisputed. Participants will be required to arrive latest by 8:30 a.m. The event will be concluded at about 1:30 p.m. The Eight ASSET Olympiad will be held at Aga Khan University, Institute for Educational Development (AKU-IED) on Saturday February 22, 2014. Schools are requested to send in the duly completed registration form (attached) latest by Tuesday, February 18, 2014. A token of Rs. 1,600/- (One thousand six hundred only) is payable as registration fee and must be attached to the registration form either in cash or in the form of pay order in the name of The Aga Khan University. We urge you to take part in this novel event and contribute in its success. Please feel free to contact PTAN Office if you have any query or require clarifications. Looking forward to your continued support and cooperation.